Begin by speaking with the Cook in Lumbridge Castle. 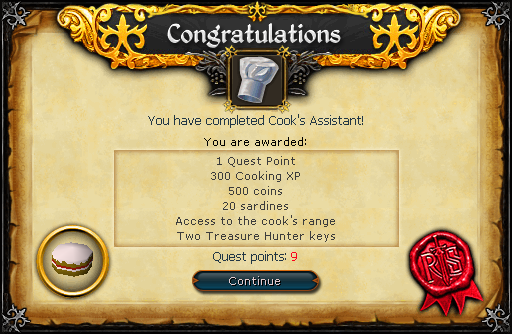 To start this quest, go to Lumbridge Castle and speak with the Cook on the first floor. He says that he's forgotten some of the ingredients for the cake that he was going to bake for Duke Horacio. Offer your help to him, and he will ask you to bring him three ingredients for the cake: some Top-quality Milk, Extra Fine Flour, and a Super Large Egg. Top-quality Milk is obtained from a Prized Dairy Cow, which can be found in a Cow pen located northeast of Lumbridge. 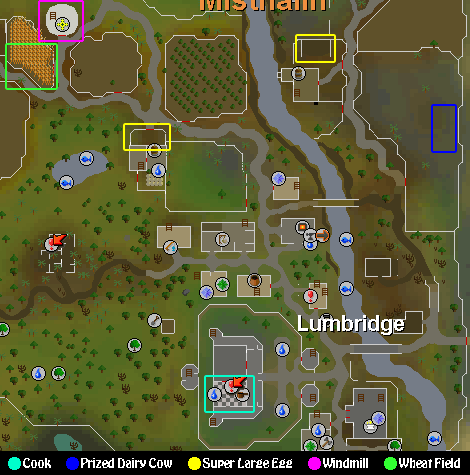 Cross over the River Lum to the east of Lumbridge Castle using a bridge, and then continue north along the road until you find the Cow pen. The Prized Dairy Cow can be found at the northern end of the pen, along with a Bucket respawn. Pick up the Bucket (if you don't already have one), and then left-click on the Prized Dairy Cow to fill the bucket with milk. You should now have a bucket of Top-quality Milk. First, the farm west of the Cow pen has a Super Large Egg respawn in the northwest corner, inside the northern building. From the cow pen, travel a short distance north along the road until you come to a small Chicken Farm. Second, there is a respawn location at Fred the Farmer's farm located directly north of Lumbridge. From Lumbridge, travel north along the road, and then continue west past the Sheep pen. Fred the Farmer's farm house is located just past the Sheep Pen, and a Super Large Egg respawn is located at the east end of the Chicken area. Now just pick the egg up and leave the farm. the final necessary ingredient is Extra Fine Flour, which is obtained by grinding Wheat into Flour at a Windmill (). However, Extra Fine Flour is special, and must be made at Mill Lane Mill located northwest of Fred the Farmer's farm. 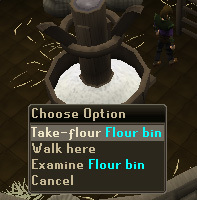 To make Extra Fine Flour, travel to Mill Lane Mill, located northwest of Lumbridge. From Lumbridge Castle, travel north along the road, and then west, past Fred the Farmer's farmhouse. There is a Wheat field located to the west of the mill. 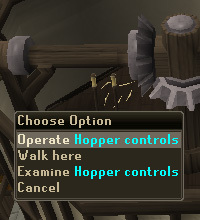 Pick some Wheat by left-clicking on it, and then enter the Windmill. Speak to Millie Miller and ask about making Extra Fine Flour and she will adjust the mill's machinery for you. If you don't have an Empty Pot with you, take one from the table at the north side of the mill. Now, climb up to the top of the windmill and use the Grain with the Hopper. Now Operate the Hopper Controls, and then climb down to the bottom of the mill. Finally, click on the Flour Bin to fill your pot with Extra Fine Flour. Now that you've got all of the ingredients, head back to the cook by traveling east on the road until you reach the castle. Talk to him again, give him the Top-quality Milk, Super Large Egg and Extra Fine Flour, and you're finished! 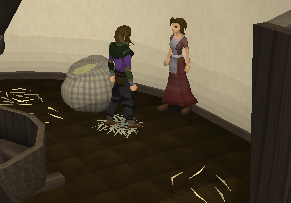 300 Cooking experience 500gp 20 Noted Sardines You can now cook on the Lumbridge Castle stove. This stove is known to burn less food than an ordinary stove, and because of the Lumbridge Castle Bank being located upstairs, makes this one of the best place to cook food in RuneScape! 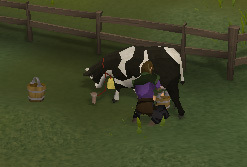 [^] To get milk, choose the 'Milk' option on a Dairy Cow in the cow field near Lumbridge (empty bucket needed). [^] Pick and Egg from a farm near Lumbridge. [^] Pick some Grain from wheat field. [^] Climb to top of the windmill north of the wheat field. 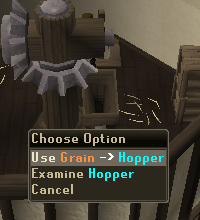 [^] Use Grain with Hopper. [^] On ground floor, empty the Flour Bin (Pot needed). [^] Talk to the Cook again.